Although it is hard work moving furniture and loading up a truck, the crews working for Junk King Dallas Mid Cities always have a terrific attitude. They are also great with solving challenges when it comes to taking out something bulky or very heavy. In the past, they have been called on to remove pianos, ping-pong tables, hot tubs and refrigerators. You won’t surprise them with whatever you want to have taken away. Junk King appreciates how busy your day might be. There day is just as busy. That’s why they want to get in and out as quickly as possible. As long as you know all the items you want taken away, then Junk King won’t have any trouble getting them out of the house and getting you back to your busy day. The only way Junk King could stay in business is if they treat their customers right. That means respecting their property. If you’re ready to get rid of your rubbish, then Junk King Dallas Mid Cities is ready to lend a hand. 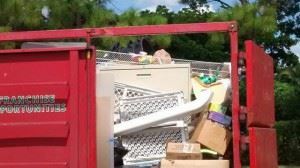 This entry was posted in Dallas Mid Cities Appliance Removal and tagged junk King, junk removal, reviews on September 25, 2017 by Junk King. Last updated September 25, 2017 .